There are several discount dental plans available in the state of Hawaii, including the cities of Honolulu, Hilo and many more. You can save between 10% and 60% on most types of dental care, including major dental, such as dentures, crowns, braces and much more. Here is an example of a discount dental plan in action. For this example we’re going to use zip code 96810, which is the city of Honolulu, HI. There are 201 participating dentists within a 50 mile radius of zip code 96810 that accept this particular plan, called the Aetna Dental Access plan. Let’s say in this first example that you are an individual that is in need of an upper denture. The usual cost of an upper denture nationally is apx. $1,252.00. This is based on figures from 2005 and may be more or less in the region where you live. The cost of an upper denture by joining this discount plan is only $783.00. That’s a big savings of $469.00! The cost of joining this individual dental plan is only $99.95 for a full year. Now let’s deduct that $99.95 from the $469.00 savings and you’ve saved a total of $369.05 on your first visit alone! 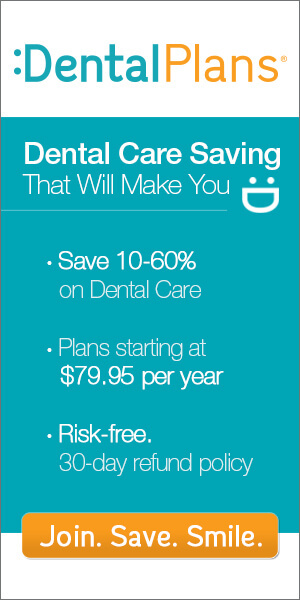 If you still have a need to see a dentist you’ll still have big savings for an entire year. Now let’s say that you need a family dental plan and the first thing you need to do is get yourself and your family in for a six month check-up, teeth cleaning and full mouth x-rays. Also, you’ll need to get any cavities taken care of while you’re there. The usual cost of a routine check up nationally is $40.00, the usual cost of teeth cleaning is $75.00, the usual cost of full mouth x-rays is $104.00 and the cost of a single one layer filling is usually $121.00. Let’s say that you have a family of four and two of you needed a single layer filling, so your usual cost of taking your family to the dentist every six months would be $1118.00. Now let’s look at what the cost would be by joining a discount plan. The discounted cost of a routine check-up is $32.00, the discount cost of teeth cleaning is $53.00, the discount cost of full mouth x-rays is $63.00 and the discounted cost of a single layer filling is $67.00. The cost of taking your family to the dentist using a discount plan is only $726.00, a savings of $392.00. Multiply this savings by two because this is a six month check-up, so you’ll be saving $392.00 x 2 = $784.00 per year. The cost of joining of joining this family dental plan is only $149.95 for your entire family to be included. Deduct that $149.95 from the annual savings of $784.00 and your net savings per year by having this discount dental plan is a whopping $634.05! Don’t wait any longer to get a dental plan for yourself or your family. Simply enter your zip code into the light blue box above Right Now and locate a participating dentist in your area. After you do this, simply enter the discount code JE10 when you get ready to check out and you’ll receive an additional 10% off the cost of your plan for the first year. You can be seeing a dentist within 1-3 days from now. So don’t put it off any longer! Enter your zip code in the box at the top of the page Right Now!